Easy and unmessy camp-style cooking in your own backyard. New England clambake-esque hobo packs. Remember when you went camping as a kid and you wrapped cut-up potatoes and onions in foil to cook in the campfire along with your hot dogs? You were making hobo packs, a time-honored camping tradition. To this day, hobo packs are a nice way to neatly portion and cook foods on the grill or right in the embers, and spending the night in a tent isn’t required. 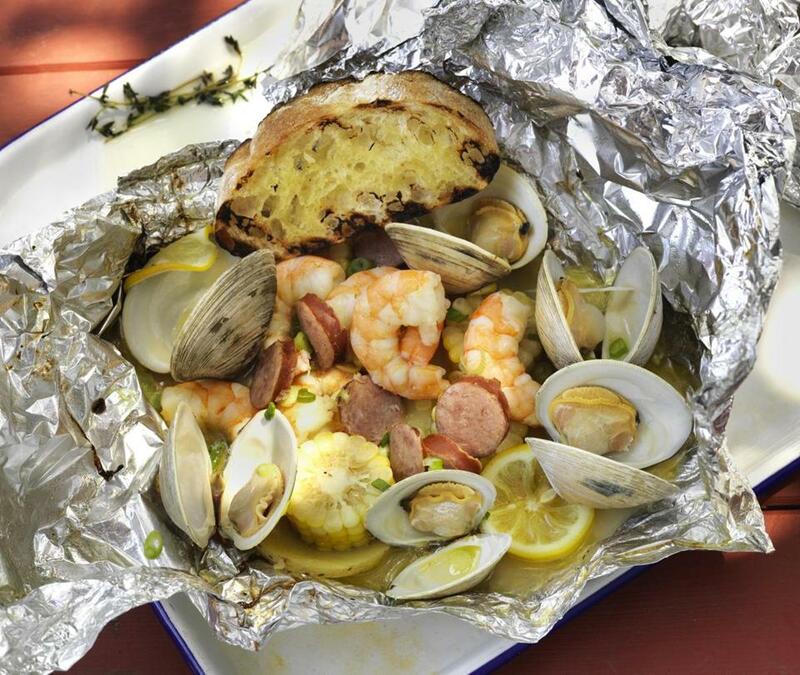 Quick-cooking seafood such as shrimp or clams works particularly well combined with potatoes, corn, and sausage and spiced in different regional styles. Don’t skimp on the size of the shrimp; smaller ones may overcook. Keep the potato slices thin so they’ll cook through. Potatoes and corn go on the bottom because they require more cooking, and the seafood near the top. Brush slices of hearty bread with olive oil, grill briefly, and serve to sop up seafood juices. Meanwhile, arrange 4 pieces of heavy-duty foil, 18 inches long by at least 12 inches wide, on a work surface; wipe the center of each with neutral oil. Arrange about 6 potato slices in a single layer in the center of one piece and sprinkle with salt and pepper. Over the potatoes, arrange 5 pieces of corn, 6 shrimp, a quarter of the sausage slices, 2 sprigs of thyme, 6 clams, 4 pieces of butter, a sprinkle of pepper, and 2 slices of lemon. Add 2 tablespoons of water, first loosely folding the long edges of foil up (to help contain the water). Fold together the top and bottom edges of the foil and then the sides several times, leaving some headroom, and crimping all the edges to tightly seal. Repeat. 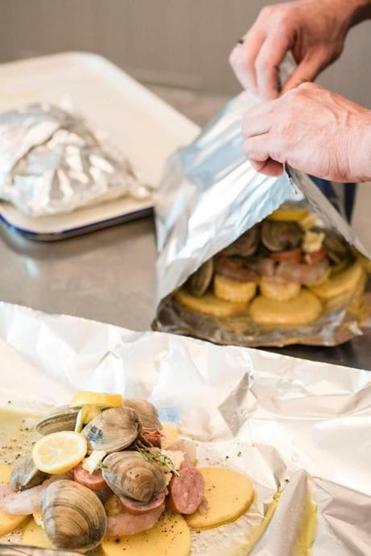 Place the packets seam side up on the grill and grill directly over the flame until they’re slightly puffed, the clams have opened, and the shrimp, corn, and potatoes are cooked through, about 12 minutes on a gas grill or up to 18 minutes on a charcoal grill. Remove and open packets, discard lemon slices and thyme sprigs, transfer contents to serving bowls, sprinkle with scallions, and serve at once with grilled bread. Tip: Seal the packets tightly so that steam can build inside. Start with the top and bottom edges, folding them together several times and crimping them tightly, and then fold the sides several times. (Foil wider than the standard 12 inches makes sealing the sides a little easier.) Leave a little headroom above the contents for the packets to puff. 1) Increase shrimp to 2 pounds (9 shrimp in each pack). 2) Halve and thickly slice 1large onion. 4) Melt the butter. In a large bowl, toss the onion, potatoes, corn, and shrimp with the butter to coat. Add 2 tablespoons Old Bay seasoning, 1 tablespoon finely grated lemon zest, and 1½ teaspoons pepper, and toss to distribute. 5) Assemble packs as directed, with onion slices in place of clams. Substitute 2 tablespoons beer for water in each pack, and grill as directed. Grilled bread is great with these, or use thick slices of baguette or hearty French or Italian bread. In a small bowl, mix plain and smoked paprika, onion powder, thyme, cayenne, and ½ teaspoon each salt and black pepper. Divide this spice mixture in half and set aside. In a small skillet over medium heat, melt 3 tablespoons butter. Add garlic and cook, stirring, until fragrant, about 40 seconds. Add 1 portion of reserved spice mixture, sugar, Worcestershire sauce, lemon juice, mustard, and hot pepper sauce, and cook, whisking, about 1½ minutes. Set sauce aside off heat. Melt remaining butter. In a large bowl, toss the potatoes, corn, and shrimp with the butter to coat. Add the remaining spice mixture and toss to distribute. Arrange 4 pieces of heavy-duty foil, 18 inches long by at least 12 inches wide, on a work surface; wipe the center of each with neutral oil. Arrange about 6 potato slices in a single layer in the center of one piece and sprinkle with salt and black pepper. Over the potatoes, arrange 5 pieces of corn, 9 shrimp, a quarter of the sausage, a sprinkle of pepper, and 2 slices of lemon. Add 2 tablespoons of sauce, first loosely folding the long edges of foil up (to help contain the sauce). Fold together the top and bottom edges of foil and then the sides several times, leaving some headroom, and crimping all the edges to tightly seal. Repeat. Place the packets seam side up on the grill and grill directly over the flame until they’re slightly puffed and the shrimp, corn, and potatoes are cooked through, about 12 minutes on a gas grill or up to 18 minutes on a charcoal grill. Remove and open packets, discard lemon slices, transfer contents to serving bowls, sprinkle with scallions, and serve at once with grilled or fresh bread.